358 pages | 90 B/W Illus. Since the start of the recent financial crisis, as most global firms struggle to remain competitive, an increasing number of Korean and Japanese firms have experienced an amazing rate of growth and expansion. Although academic researchers and business leaders in the United States, China, Brazil, India, and Europe seek out the secrets to these businesses’ success, little is known about their business practices. 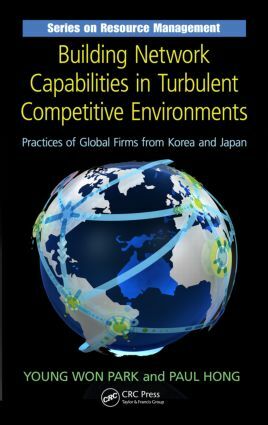 Supplying an insider’s perspective, Building Network Capabilities in Turbulent Competitive Environments: Practices of Global Firms from Korea and Japan unveils the strategic and operational practices that have allowed these firms to catch and surpass their competitors in North America and Europe. Based on fieldwork studies and extensive interviews with senior executives, it explains how these companies have developed and enhanced their core competencies through effective integration of product architecture, supply chain management, and IT strategy. The book provides practical insight into changing business patterns while avoiding extensive mathematical algorithms and drawn-out theoretical descriptions. It uses cutting-edge case studies to illustrate the innovative manufacturing strategies of these rapidly emerging companies. Accessible to anyone with a basic understanding of business, it reveals the organizational processes of strategy formulation and implementation that are required for success. Providing a clear understanding of both the career implications of the changing business landscape and how to deliver products and services that meet and exceed the needs of your customers, this book will help you develop the socio-technical skills needed to succeed in an increasingly competitive and turbulent business environment. Dr. Young Won Park is an associate professor of Manufacturing Management Research Center at the University of Tokyo, Japan. Dr. Park holds a Ph.D. degree in the Department of Advanced Social and International Studies from the University of Tokyo, Japan. His articles have been published in journals including Management Decision, International Journal of Production Economics, International Journal of Services and Operations Management, International Journal of Logistics Systems and Management, Japan Academy of International Business Studies, Japanese Society for Science and Technology Studies, and the Japan Society of Information and Communication Research. He has received research awards including dissertation paper awards from the Japan Association for Social Informatics (JASI), best paper awards from the Japan Society of Information and Communication Research (JSICR), research awards of the Social Science Field from the Telecommunications Advancement Foundation (TAF), and research students awards of the Social Science Field from the Telecommunications Advancement Foundation (TAF). His research interests are in technology management, IT strategy, and global supply chain management. Dr. Paul Hong is a professor of operations management at the University of Toledo, Ohio, in the United States. Dr. Hong holds a Ph.D. degree in manufacturing management and engineering from the University of Toledo. He also holds an MBA and an MA in economics from Bowling Green State University and a BA from Yonsei University in Seoul, Korea. His articles have been published in journals including Journal of Operations Management, International Journal of Operations and Production Management, International Journal of Production Economics, International Journal of Production Research, Management Decision, Journal of Supply Chain Management, European Journal of Innovation Management, Journal of Enterprise Information Management, Journal of Knowledge and Information Management, International Journal of Quality and Reliability Management, Benchmarking: An International Journal, Strategic Outsourcing: An International Journal, Research in International Business and Finance, Korean Journal of Tourism Research, and Tourism Culture and Science. His research interests are in technology management, operational strategy, and global supply chain management. He is International Research Network Coordinator of Annual Symposium and Workshop in Global Supply Chains. He is also US coordinator of International Manufacturing Strategy Survey (IMSS).